"Vienna has a great musical tradition and wants to use the occasion of Mozart's birthday to invest in the cultural and musical life of the city." — Franz Patay: Executive Director "The Vienna Mozart Year 2006." "Happy birthday, Mr. Mozart." And to celebrate the 250th anniversary of arguably the greatest musical genius of all time, Vienna is throwing a year long party. But why Vienna? After all Johannes Chrysostomus Wolfgangus Theophilus Mozart was born in Salzburg on 27 January 1756 and lived there, on and off, for over two thirds of his life. But it was in Vienna, however, that he married Constanze, fathered six children, composed his most important works and where he died and was buried. It was also in Vienna that the child prodigy — a little man in a powdered wig carrying a miniature dagger — first sprang to the attention of the Austrian nation. As a six year old, in the Hall of Mirrors at Vienna's imposing Schonbrunn Palace, the child genius entranced Empress Maria Theresa with his musical talent, and on completion of his recital is said to have jumped unto the Empress's lap, to hug and kiss her. It was not until 1781, when he was discharged in disgrace by his employer, the Archbishop of Salzburg ("sent out the door with a kick up the arse"), that Mozart, now 25 years of age, chose Vienna as his home. 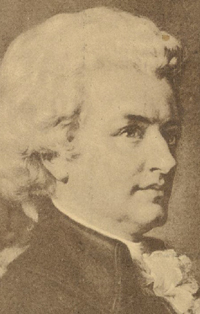 In this city, with its lively court society, Mozart saw the opportunity to make a living from commissioned compositions, teaching piano, and giving recitals. As he himself enthused, "What a magnificent place, and for my métier, the best place in the world." Despite the fact that the house where he died in Rauhensteingasse, while composing his famous unfinished Requiem, has long since vanished and the exact location of his grave in St Marx Cemetery is still unknown, the Viennese have taken Mozart to their hearts, hailed him as an adopted son, and will party all year long in his memory. Celebrations involving 80 major organizations, presenting between them in excess of 700 concerts in 170 locations across the city, is a major programming feat and, as Patay modestly states, "One requiring great diplomatic and logistic skills." While the festivities are estimated to increase tourist numbers by some 7 to 10 percent, according to Patay, "We will not be creating artificial events just to lure tourists. If the programme is not of interest to the people of Vienna, we cannot expect overseas guests to be interested either." Just who wouldn't be interested in some of the stars appearing during the year? Sir Simon Rattle, and a host of other world famous luminaries, will conduct the plethora of world famous Viennese orchestras; Placido Domingo and the Vienna Boys Choir will display their vocal talents; the Vienna State Opera and the Theater an der Wien will stage Mozart's major operas. Jazz is not forgotten, with renowned pianist Chick Corea presenting a chamber music concerto. Mozart's symphonies, concert and choral works can be heard at such venues as the Vienna Konzerthaus, Schonbrunn Palace, the Imperial Palace (Hofburg) the Auersperg Palace and a host of other locations including shopping centres, train stations, factories, city squares, hospitals, hotels and parks. As Patay puts it, "Bringing Mozart to places where classical music is not generally played." In all, over 3200 presentations of the great man's works are scheduled over the twelve months. In the latter part of 2006, internationally acclaimed director Peter Sellars will present a festival based on the themes of "Transformation," "Reconciliation" and "Remembrance." Entitled "New Crowned Hope," after the Masonic Lodge Mozart helped establish in 1791 towards the end of his life, it promises to be an intellectually challenging feast. Sellars will assemble many artists from a wide range of disciplines posing the question, "How would Mozart compose today?" Audiences can look forward to contemporary interpretations of Mozart's ideas and new productions generated by his work, but which may not contain a single note of the great man's music. "We want to bridge the gap between the past and the present," says Patay. "What does Mozart have to say to us today?" This "updating the relevance" of Mozart, is just one of the criteria which underpins the extensive "Mozart 2006" programme. Opera "The Marriage of Figaro"
It was at Domgasse 5 that Mozart gave numerous concerts, threw wild parties, and hosted many illustrious colleagues including Joseph Haydn. In the recently renovated Mozarthaus, through use of state-of-the art multimedia and interactive displays, visitors can get to know the great man, listen to his music, learn how the family lived, "meet" his friends and foes, and generally gain an insight into life in 18th century Vienna. In addition to the Mozart and social memorabilia, part of the 1000 square metre, six floor exhibition in the Mozarthaus is devoted to a small concert hall, café and souvenir shop. The Albertina, the magnificent neo-classical Habsburg Palace built during Mozart's time and located next to the State Opera House, will host a major exhibition focusing on the composer's ideas and his enduring influence. 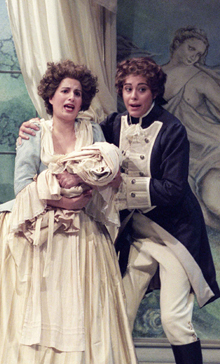 It will seek to create, says Patay, "A bridge from Mozart's time to contemporary society." Prized artworks and exciting virtual-reality installations chronicle the maestro's life, exploring themes such as his progress from whiz kid to freemason, from child genius to confectionery cliché, while exploring the intellectual and philosophical horizons of his free spirit. One of the more unusual exhibits is a modern interpretation of a Montgolfiere – a hot-air balloon like those which so fascinated Mozart. On the Rathausplatz, the magnificent façade of Vienna's neo-Gothic City Hall serves as a backdrop for the Mozart Film Festival. Here Mozart operas and concert performances, staged at the world's leading venues, enhanced by first-class sound and projection technology, can be viewed at dusk each evening (between July and September) on a giant screen. Admission is free, with patrons able to purchase a wide range of gastronomic delights from the many food outlets around the Square. Programmes for children and youth; for dance, theatre and literature; for performance and painting, will all seek to keep, what Patay terms, "the freshness and dynamic tension" of the "Spirit of Mozart" in Vienna during 2006. Given the extent and breadth of the programme, it is unlikely that 31 December 2006 will herald the final coda of the "Mozart Year," but merely serve as a prelude for all the Mozart years to come. John Hagan was hosted by the Vienna Tourist Board.